Since I am in the portrait mode, I will do more studies to see if I can improve a little. I did this one the day after I did the previous head study, but at different location. 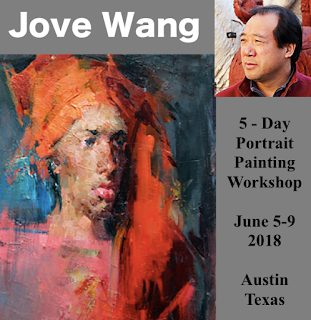 I documented what I have done with this two paintings, and figured out what I should present on the portrait day of my forthcoming workshop. I plan to stay with monochrome a while for my head studies. Coming back from Pennsylvania. 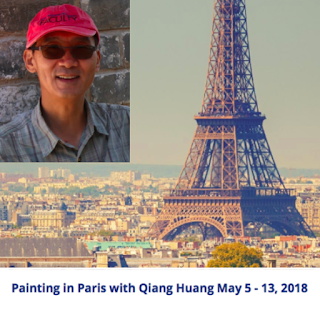 I had about two weeks at home before my next workshop trip. Since the next workshop I need to demonstrate how I paint portrait, I needed to warm up and prepare a little. I have not painted human face from quite a long time. So I did this study. I used only transparent oxide red and naples yellow light. The monochrome approach allowed me to concentrate on the forms and features of the face. I was kind of happy for the turn out of this painting. 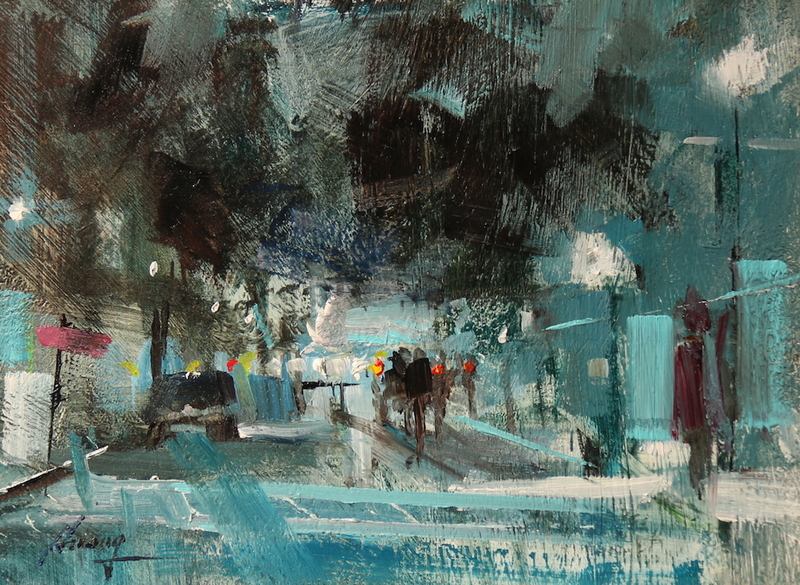 "Demo at Sunbury 2017 3"
I like the grey in this demo painting. Floral painting tends to be more colorful, but I want to be careful not to use too much saturated or high chroma colors, otherwise it will look garish. Grey is sophisticated. It is rather hard to get it right. "Demo at Sunbury 2017 2"
The Art Cent at Sunbury collects pencil sharpeners. I put one of them in this demo and use color pencils and marbles as the color providers. I like that little mouse figurine candle stick so I put it in. That is the second demo. "Demo at Sunbury 2017 1"
You probably get tired of seeing my landscape paintings by now. I am showing you still life today. After Easton, I drove up to Pennsylvania for another workshop teaching. I stayed at Lewisburg and taught at Sunbury. They are charming small towns. I want to thank Yarts Center, and Lina Ferrera for organizing, and thanks to all the artists for coming. This is my first demonstration painting. 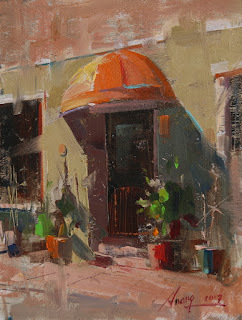 This small 6"x8" is my last demo on my Easton workshop. 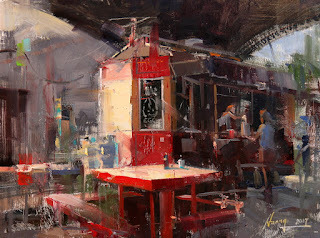 This time at Easton, I surely did many plein air paintings - 14 of them. Now I have a different feeling about plein air painting. It has expanded my art capability. I have extended from still life into landscape a little further. My landscapes still have a long way to go before reaching some sort of maturity, but I am glad I am on the path now. I hope I will have some sort of style gradually evolved from more practices in the days to come. Austin has cooled down a little. I feel we will have a beautiful fall this year. It is time to remind all of you that we have a few workshops planned in the Austin area. Stephanie Birdsall will teach a 4-day painting workshop from 9/30 to 10/3. Stephanie is a well known Putney painter and a wonderful teacher. I am so happy she will come to Austin again. So far, we still have a few openings for her workshop. 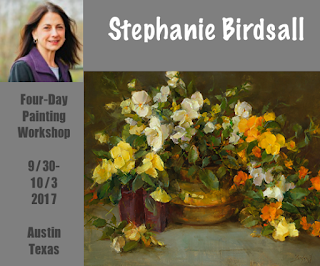 Please get detailed information at: Stephanie Birdsall's workshop at Austin and sign up. We are looking forward to seeing you in the beautiful Texas Hill Country. 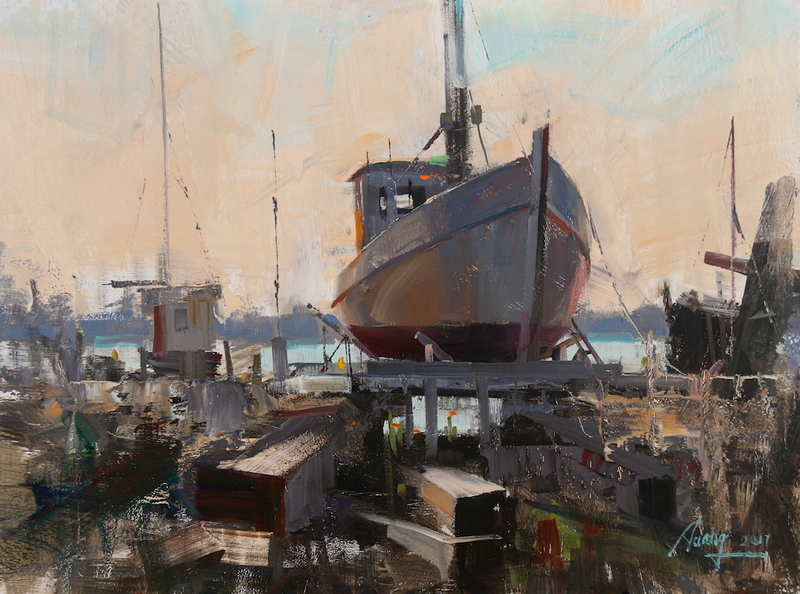 "Demo at Easton 2017 3"
The third demo I did was at the Maritime Museum in St Michaels. I have simplified the background significantly. The realistic presentation of the boat gives me room to go abstract for everything else. You may think I have painted the pier, figures, trees, and so on, but in reality I just painted some textures. 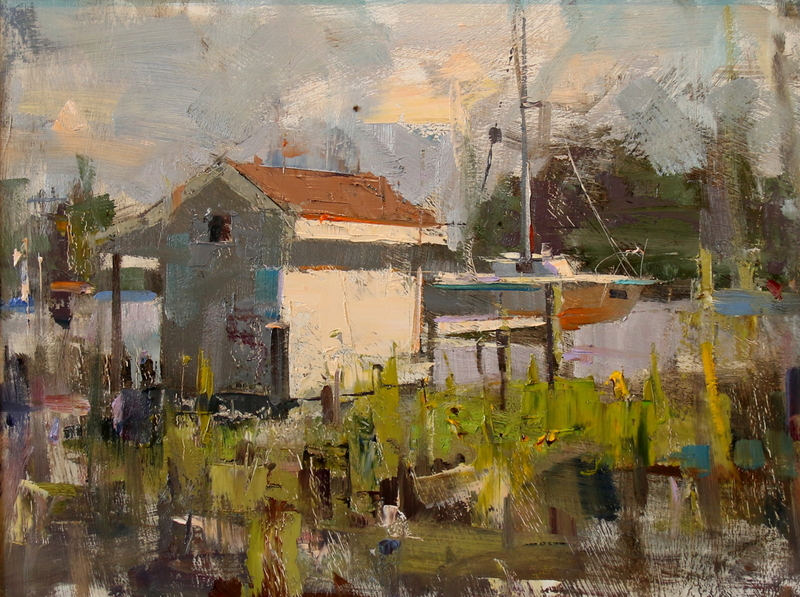 I painted this boat house as my second demo to show how I handle linear perspective. 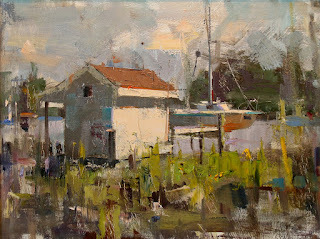 Recently, I have done quite many plein air landscape paintings. 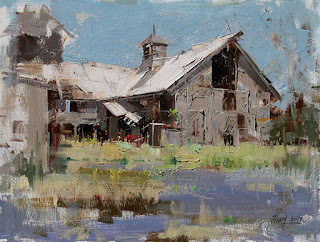 Through all of these exercises, I have discovered so many issues in my landscapes. I don't have all the solutions yet, but I have start to aware of the areas I need to work on. I really do not know how to paint sky and water. I don't know how to paint grass and trees either. There is a long learning curve I need to across. Now it is time to work thing out. I am in my research mode again. On the next day after Plein Air Easton 2017 ended, I started my workshop teaching. It was a 4-day plein air painting at the same town. The weather was much nicer. It was not that hot. The humidity was still high. 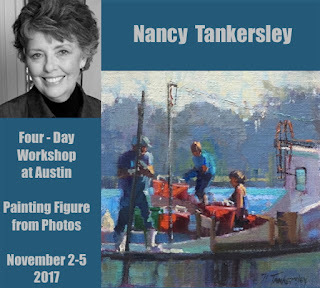 I want to thank Carl and Nancy Tankersley for organizing, and thanks to all the artists for coming and painting with me. I painted the same building that I did for my quick draw during the festival, but from a different angle. Color temperature control was my main topic I was emphasized during this demo. This is my final piece at the Plein Air Easton 2017. It was my quick draw painting. This building is quite complicated. I simplified it a lot, so I can finished it within 2 hours. 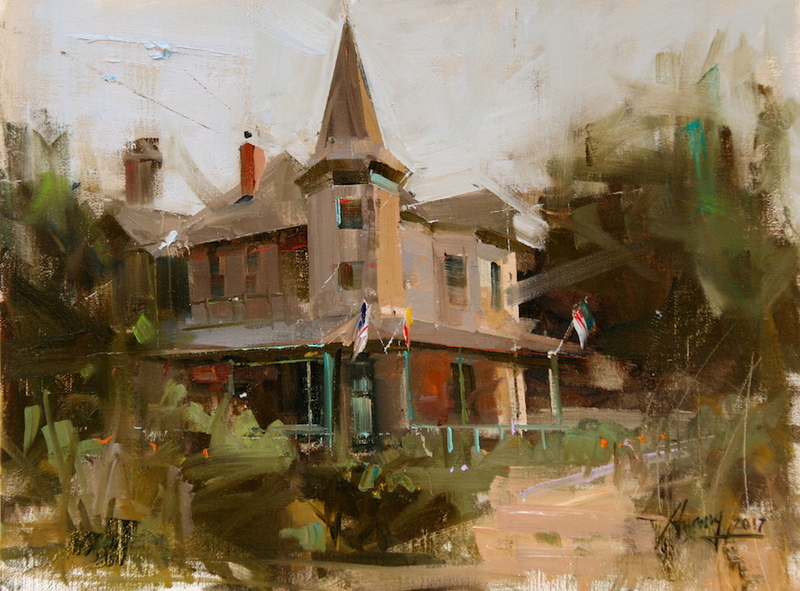 Plein Air Easton has ended. I surely learned a lot. "Rise Up Coffee" is a great place at Easton, wonderful food and friendly people. They make their food in a red trolly. I did this plein air right in front of it.